The biggest surprise fro me in the social media rankings that I posted earlier today was the appearance of document sharing service Scribd in the top 20. According to the comScore numbers, it has more unique visitors worldwide than imeem and almost as many as Bebo, with 23.5 million visitors in November, 2008. (In the U.S., it had about 4 million visitors). This is a serious accomplishment for a startup that launched less than two years ago with $300,000 in seed capital. 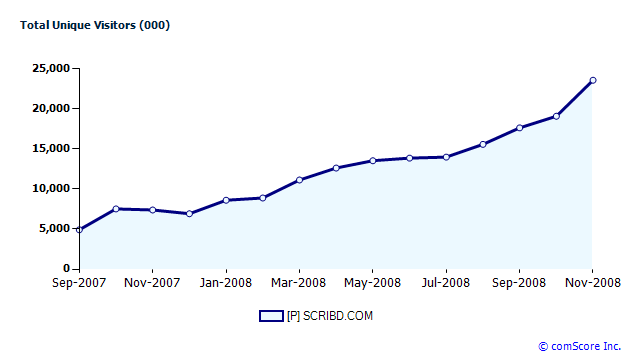 Scribd, which raised a $9 million B round earlier this month, grew 218 percent from November, 2007. Scribd is heads and shoulders above other document-sharing services such as Docstoc (1.6 million uniques) and Issuu (1 million) in terms of attracting users. (All three are excellent services, by the way, and Docstoc is much closer to Scribd in the U.S.). Scribd users upload 50,000 documents every day. What this tells me more than anything is that the concept of document sharing on the Web has legs and there is a real demand for it. (Unless Scribd’s numbers are artificially inflated—Quantcast shows an unusually steep drop-off in December, but that could just be a problem with Quantcasts’s data). Desktop-bound document formats like PDFs, Word docs, Powerpoint slides, and spreadsheets are increasingly irrelevant if they cannot be viewed and shared online directly in a browser. Scribd’s paper is an embeddable Flash viewer for nearly all document types. (I’ve embedded a document with sample job interview questions below). It looks like we are not the only ones who like to embed documents on the Web. The drop-off on Quantcast was caused by the fact that we removed the Quantcast pixel from Scribd for a little while because it was slowing down page loads. However, I’m not sure why these numbers are still on the low side. According to our Google Analytics, we did 39.9 million unique in November, and if you include views of iPaper on other websites, it was way over 50 million uniques.